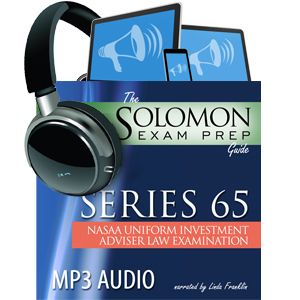 This 20-hour audio recording of The Solomon Exam Prep Guide: Series 65—Uniform Investment Adviser Law Examination will give you the content of this invaluable and enjoyable study guide in an audio format. After hearing the book’s well-written content, you will be even more prepared to tackle the Series 65 exam with confidence! The Series 65 audiobook is a great companion to the Series 65 Online Exam Simulator, the industry-leading online testing program that ensures you are learning and retaining the information. How do I schedule my Series 65 Exam? What does the Series 65 qualify me to do? A Series 65 license qualifies you as an investment adviser representative, enabling you to provide investment advice to clients. We recommend studying 100 hours over a five-week period. Note: Scores are rounded down to the lowest whole number, so a 71.9% would be a final score of 71%-- not a passing score for the Series 65 exam. What happens if I pass the Series 65 but I do not complete the registration process? After passing the Series 65, you have two years to become registered with a state otherwise the exam will show “expired” in the Central Registration Depository, and you will have to sit for the exam again. Contact your state regulator for more information regarding your state’s registration rules and process. Are there other FINRA exams I need to complete as a prerequisite to attempting the Series 65? There are 130 scored and 10 unscored questions. These 10 unscored questions are randomly distributed so test-takers do not know which ones they are. The unscored questions are being tried out by the exam committee. Three hours.You are allowed to take restroom breaks during the exam; however, the clock will continue counting down. Please contact your preferred testing center for additional information. The cost of the exam is $165 at this writing. If I stop working for my firm, how long will my Series 65 license remain active? The study material was absolutely perfect. My undergrad degree is in Mechanical Engineering and my graduate degree is in management so no formal finance education and it would not have been possible to pass the Series 79 without the Solomon material. Thanks so much.